As things appear, we live in a solid universe. Our physical bodies, our clothing, and the ground we walk on all appear to be solid material with actual substance. Our senses tell us that the food we eat, the air we breathe, and our overall physical experience in life all have tangible integrity and corporeality. However, according to numerous scientific and philosophical sources, the material world is much different than appearances reveal. When we look at the universe at the subatomic level, we see that most of the material reality we operate within is made up of 99.9999 percent empty space. If we zoom into material reality even farther, we eventually reach the quantum level. At this level, we may witness conditions that are even stranger than those at the atomic scale. Here we see that the basis of the entirety of the material universe only exists for a fraction of the time. At the quantum level, we see that energy travels in packets, but these packets do not travel in solid linear paths, as we might expect. In fact, these energy packets only seem to exist for fractions of seconds. That is, at the quantum scale, particles such as electrons travel in segmented paths—disappearing and reappearing as they move forward on their semi-linear journey. These two valid scientific principles prove that our reality is not as solid or as absolute as we may have thought. But if reality is not concrete and is actually blinking in and out of existence from one moment to the next, why then does it appear solid? If matter is not so concrete, what is it that allows us as human experiencers to perceive it as such? To begin this discussion, here is the Huffington Post with some intriguing insights about the concepts of space and time. This past fall, the world of physics celebrated the 100th anniversary of Albert Einstein’s general theory of relativity, which forms the foundation of our modern understanding of the force of gravity. Einstein’s creation has been the ultimate antidote to a blasé, seen-it-all attitude that sometimes infects even scientists. It opened up a universe that never ceases to surprise — black holes, the big bang, dark energy, gravitational waves — jolting us out of the grooves of thought that we fall into all too easily. Yet the ink was barely dry on the theory when Einstein saw a problem. It contradicted quantum mechanics, suggesting that physicists needed an even deeper theory to unify these two pillars of fundamental physics. In June 1916 Einstein wrote: “Quantum theory would have to modify not only Maxwellian electrodynamics but also the new theory of gravitation.” That was quite an insight when you consider that quantum theory didn’t even exist yet. It was still a nebulous idea that wouldn’t coalesce for another decade. So, we have been celebrating the centenary not only of Einstein’s theory, but also of the long slog to supersede it. "A theory of gravity is also a theory of space and time." Whereas general relativity took a single genius a decade to create, that deeper theory — known as a quantum theory of gravity — has flummoxed generations of geniuses for a century. In part, physicists are victims of their past successes: when you accomplish anything in life, you raise the bar, making it that much harder to take the next step. But quantum gravity also poses difficulties that are unique in the history of science. A theory of gravity is also a theory of space and time — that was Einstein’s great insight. Yet physicists have always formulated their theories within space and time. So, a theory of gravity swallows its own tail. It supposes, for example, that the passage of time varies, but the word “varies” connotes a temporal process. If time is varying, then the very standard by which it is varying also varies. The whole situation threatens to become paradoxical. This conceptual circularity creates weird mathematical difficulties. For instance, the little ‘t’ that physicists use to denote time drops out of their equations, leaving them at a loss to explain change in the world. To describe what happens, physicists need to go beyond space and time. And what is that supposed to mean? Such an idea forces us into (literally) uncharted territory. String theory, loop quantum gravity, causal-set theory: these are just a few of the approaches that theorists have taken. Naturally, proponents of each are convinced the others are misguided or even downright unscientific. But when you take a step back from the dispute, you notice all agree on one essential lesson: the space-time that we inhabit is a construction. It is not fundamental to nature, but emerges from a deeper level of reality. In some way or other, it consists of primitive building blocks — “atoms” of space — and takes on its familiar properties from how those building blocks are assembled. These “atoms” are clearly nothing like ordinary atoms such as hydrogen or oxygen. For one thing, they are not tiny, because the word “tiny” is a spatial description and these atoms are supposed to create space, not presuppose it. Yet many of the same principles apply. Water, for example, consists of H2O molecules. It can undergo a change of state — freezing or boiling — as those molecules rearrange themselves into new structures. The same might be true of space. If those atoms can assemble themselves into space, presumably they could also reassemble into other structures. And that might explain many of the mysteries of modern physics. "The ordinary laws of physics, operating within time, are inherently unable to explain the beginning of time." Consider black holes. If, God forbid, you fell into one, Einstein’s theory predicts your timeline would end. You would die, but that’d be the least of it. The atoms in your body would simply cease to be. Instead of ashes to ashes, you’d have ashes to ... nothingness. The new emergent space-time theories suggest a different picture in which space undergoes a change of state in a black hole. The black hole does not have an interior volume; its perimeter marks where space melts. The result is a new state that is no longer spatial and is scarcely even imaginable in human terms. If you fell in, you would probably still die, but the atoms in your body would still carry on in some new form. Consider, also, the big bang. Like black holes, it has always posed something of a paradox. The ordinary laws of physics, operating within time, are inherently unable to explain the beginning of time. According to those laws, something must precede the big bang to set it into motion. Yet nothing is supposed to precede it. A way out of the paradox is to think of the big bang not as the beginning but as a transition, when space crystallized from a primeval state of spacelessness. Finally, consider the mysterious phenomena of quantum nonlocality — what Einstein called “spooky action at a distance.” Two or more particles can act in a coordinated way, no matter how far apart they may be, and they do so without sending out a sound wave, beaming a radio signal or otherwise communicating across the gap that separates them. The particles behave as though they are not, in fact, separated. And one possible explanation is that the particles are rooted in the deeper level of reality where distance has no meaning. This article seems to present the situation of Einsteinian physics together well. It was especially interesting to see Einstein's quote and foresight about how a valid theory of spacetime would include the principle of gravity as well. According to the latest unified field theory, gravity does, in fact, include a significant component of spacetime. The above post is insightful. Yet at the same time, it seems to talk in circles with regard to scientific theory, and to mimic the cyclic and in many cases, unproductive thought processes of current science. It was interesting to see the point made about the difficulty of progression in modern physics. According to the article, the difficulty lies in the fact that if the scientific community makes an achievement, they are left with the task of progressing beyond that achievement. However, this is only half true. It seems that it is only difficult to take the next step in science when there is a refusal to acknowledge past mistakes—mistakes which, up until this point, have been accepted as sound without ever being questioned. According to research, this lack of willingness to self-criticize is the central reason behind much of the difficulty and stagnation within modern science. As things stand, the current model of science is extremely disjointed and discontinuous with regard to provable theory. For years, there has been one theory after another coming forward and many times, these theories are accepted as valid even though many of them directly contradict numerous other accepted theories. The failure of this establishment to successfully formulate a unified field theory is a prime example of said issue. As mentioned in the article above, Einstein (along with the current scientific establishment) failed to formulate an explanation for the ways in which the cosmic and the quantum worlds intersect. Ever since the early days when these two branches of physics intersected, they have been at logical odds with one another. On their own, the theories of either discipline appeared to hold strong. However, when the theories of either science were compared, they never seemed to add up. The reason science seems so disjointed at present may be that some reevaluation is needed with regard to scientific fundamentals. When assembling a jigsaw puzzle, if a person is proficient and attentive to what they are doing, the task of assembly will become more and more simplified as the puzzle nears completion. This simplification compounds until the puzzle is finally solved. In general, this is our experience with solving any problem in life. However, in modern science, the process only seems to yield greater and greater levels of seemingly endless complexity. As things stand, the current status quo of science is to build upon the standards of decades past. Most scientists adhere rather strictly to the theories of the past while failing to truly examine whether or not these theories are valid. Many of these scientists are tenured PhDs who have no interest in risking their respected positions for the sake of assuring the integrity of the science they profess. To add, virtually none of the colleagues of these scientists are interested in rocking the boat by questioning the foundation of such apparent scientific achievement. Even still, prestige is no substitute for scientific accuracy. As we may know, when we fail to acknowledge possible flaws in currently accepted models of science, we doom ourselves to remain stagnant and ignorant of the truth of our universe. If a proposed scientific principle only complexifies as its solution is pursued, chances are one or several mistakes were made in the development of that principle. Simply put, the scientific establishment is long overdue for a trip back to the drawing board. One of the groundbreaking research endeavors which shed light on this subject was that of Dr. Harold Aspden, whose work piggybacked that of Dr. Einstein on the subject of spacetime. Dr. Aspden created a model of physics in which spacetime actually had calculable structure. He proposed that all of spacetime was structured by a quantum lattice arrangement of spheres called muons which are several times larger than electrons, and that these muons were nested within a lattice structure of cubes. These spheres could vary in size and energy depending upon their exterior influence, but in general, these muons were proposed to compose the structure of the entire universe. This theory of Dr. Aspden seems to support the above article with regard to the fundamental substance of spacetime. According to the Huff Post article, the substance or nature of black holes is much different than that of regular space, and this difference of basic structure within spacetime may be explained by an alternative arrangement of muon particles. But why is this significant? Before we answer, let's look at one more proposal of mainstream science that is gaining momentum and may progress to a greater acceptance of unified scientific theory in the mainstream arena. This is The Mind Unleashed with an intriguing proposal which explores the similarities between the universe and the human mind. The idea of the universe as a ‘giant brain’ has been proposed by scientists – and science fiction writers – for decades. But now physicists say there may be some evidence that it’s actually true. In a sense. According to a study published in Nature’s Scientific Reports, the universe may be growing in the same way as a giant brain – with the electrical firing between brain cells ‘mirrored’ by the shape of expanding galaxies. The results of a computer simulation suggest that “natural growth dynamics” – the way that systems evolve – are the same for different kinds of networks – whether its the internet, the human brain or the universe as a whole. A co-author of the study, Dmitri Krioukov from the University of California San Diego, said that while such systems appear very different, they have evolved in very similar ways. “The result, they argue, is that the universe really does grow like a brain. 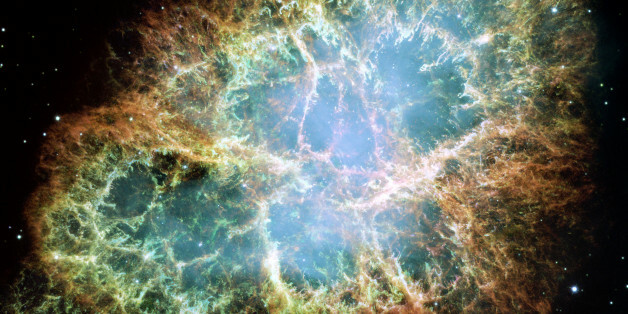 The study raises profound questions about how the universe works.” Krioukov said. “For a physicist it’s an immediate signal that there is some missing understanding of how nature works,” he told Space.com. The team’s simulation modeled the very early life of the universe, shortly after the big bang, by looking at how quantum units of space-time smaller than subatomic particles ‘networked’ with each other as the universe grew. They found that the simulation mirrored that of other networks. Some links between similar nodes resulted in limited growth, while others acted as junctions for many different connections. For instance, some connections are limited and similar – like a person who likes sports visiting many other sports websites – and some are major and connect to many other parts of the network, like Google and Yahoo. No, it doesn’t quite mean that the universe is ‘thinking’ – but as has been previously pointed out online, it might just mean there’s more similarity between the very small and the very large than first appearances suggest. 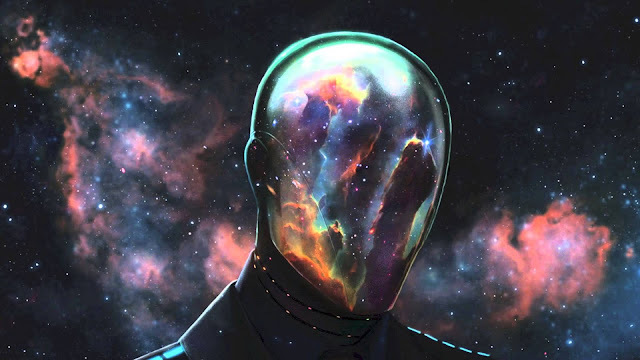 We talk about consciousness being the underlying fabric of the universe from which all things emerge (M-theory, string theory, Unified Field Theory, etc). Consciousness has been known to be the ground of being. 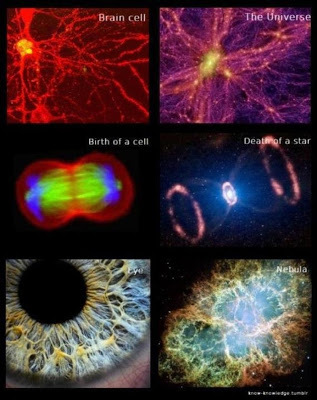 So not only is the universe conscious like a brain, it is growing like a brain as well. But here’s a question…a brain to what? Is it possible we exist as a thought within the mind of some Super Intelligence? 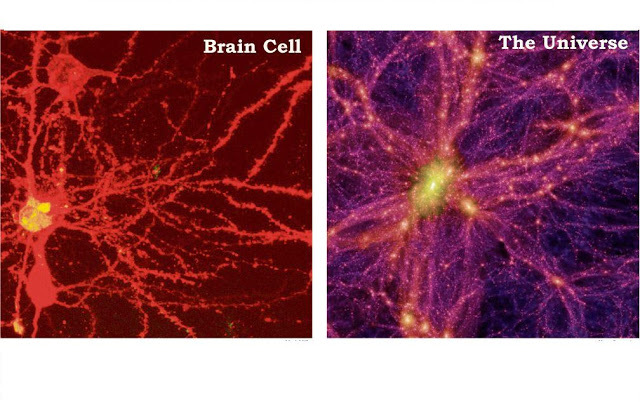 Are we just brain cells operating within a Cosmic Mind? Maybe, maybe not, but it’s fascinating to think about. This is a particularly intriguing proposal to consider, I think. To discover such similarity between multiple characteristics of the human brain and the universe is no small achievement. But how does this relate with the work of Dr. Aspden and the questions which Einstein's theories raised? 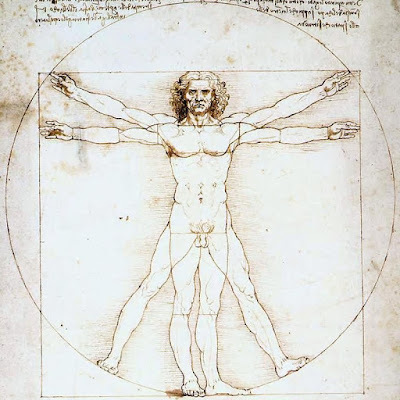 In a previous article, we discussed the strong influence which sacred geometry has on the human body, and how phi ratio, the science of cymatics, close-packed spheres, and the Platonic solids can be found within human anatomy. We discussed how these universal design patterns can be found at virtually every level of scale in countless contexts within universal forms and function. We also discussed how this geometry was so interconnecting on every level of scale from the cosmic to the quantum. This relationship was found to be so consistent between the cosmos and the human anatomy that the correlations suggested that the human body is fundamentally connected to the universe, and could actually influence the way in which the universe functions. As it turns out, the theories of Dr. Harold Aspden seem to suggest the same thing. 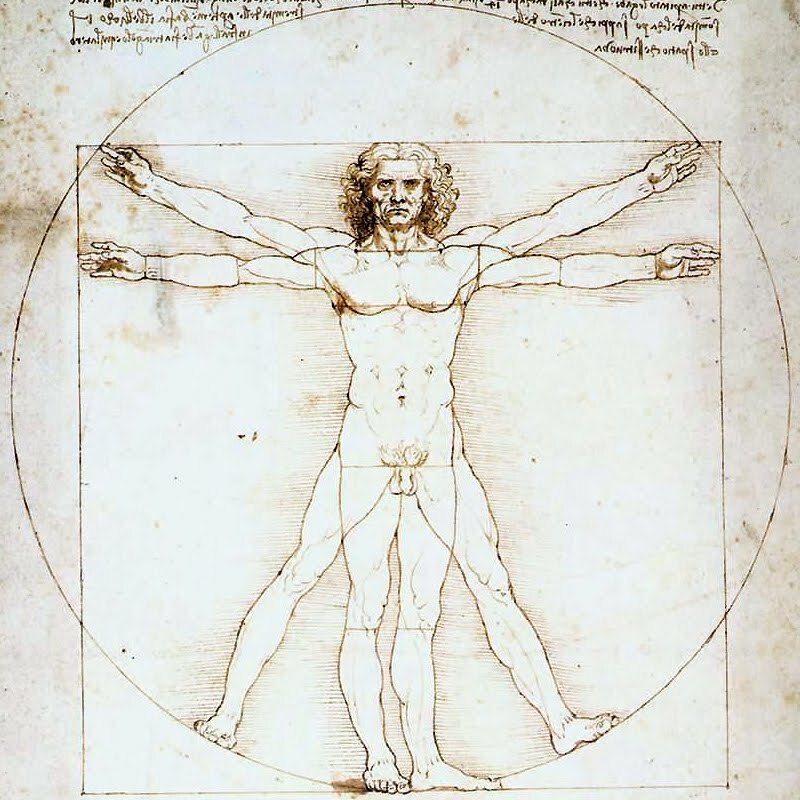 When we consider the arrangement of the square within the circle, we may notice the striking relationship between this and the design of the Da Vinci's Vitruvian Man. We can see that the square and the circle which trace the outermost portions of the Vitruvian Man embody a two-dimensional version of Dr. Aspden's muon within its cubical lattice structure—the cubes within spheres. Of course, the human body is not two-dimensional, meaning that the square and circle directly relate with the sphere and the cube. This is yet another example of our physical anatomy mimicking the cosmos with remarkable precision. To discover a past scientific theory which demonstrates a working model of the very principles which mainstream science is now examining, seems particularly noteworthy. What is even more profound is the fact that we humans are conscious and self-aware. To see that we have the exact same structural design as the universal theory of spacetime suggests a familiar relationship between these. Further, it suggests quite clearly that at some level, the universe and the fabric of space time may be conscious. If spacetime is a fluid substance which is constantly influenced by harmonic frequency to create sacred geometric structures such as the muon, the Platonic solids, and iterations of spherical geometry, this means that Dr. Apsden's theory fits well with the latest model of unified physics. For more on this theory, see the work of award-winning physicist, Dr. Nassim Haramein. Let's consider for a moment, our common (and misleading) perception of a solid universe. As we stated previously, the world appears to be solid. However, when we zoom into the quantum foundation of reality, we see mostly empty space and temporary energetic transfers which only last for fractions of seconds at a time. What is it that causes us to perceive a concrete, continuous physical experience when we know that scientifically, the universe is not solid at all? It may be our power of choice that allows us to perceive space and time the way we do. Our collective decision to see a concrete world of largely unchanging material provides us with that precise experience. It is not necessarily because the world is actually solid and continuous, but because we believe it to be so that we perceive it as solid. When we consider the concept of the observer effect, a few revelations seem to emerge. If we remember, the observer effect in physics is the tendency of electrons to actually change states simply as a result from being observed. During experiments, as these electrons are sent from one position to another, the electrons can either travel as particles or waves. When they are left unobserved, they remain as waves, but when observed, they contract back into particular form. If a person or some type of recording device observed the experiment, the electron will always travel as a particle, but when left unobserved, it travels as a wave. This remarkable and yet baffling effect raises some weighty questions. One of which is, "To what degree can we affect physical reality simply by observing it?" If a tree falls in the forest, does it make a noise? This conundrum is well-know (at least in the West). However, a more appropriate question for our purposes might be, "If no one—neither animal nor human—is in the forest, do the trees actually exist in the way we believe them to?" How great of an affect can we have on the universe around us? If electrons physically change their behavior when they are observed, this means that somehow, physical reality is aware of when it is being observed. This supports the possibility that just as we as conscious humans observe the universe, to some degree, the universe is observing us. So what are some other signs we might use to determine the level of consciousness of our universe? Let's consider natural evolution. When we think about the background processes behind the progression of evolution, we see something very interesting. Within the process of micro-evolution, a species will undergo sudden changes from one generation to the next. This process is thought to occur due to various stresses the organism experiences throughout its life cycle. As we may know, nature has a way of creating and maintaining homeostasis in the most efficient way possible. If an organism experiences stress from their environment, nature has a way of altering the organism so that the stress can be alleviated so that the plant or animal can have the greatest chance of surviving and thriving within it. The interesting aspect about this micro-evolutionary process is that it would not be possible if there were not some level of consciousness outside the organism itself observing and adapting its anatomy and/or behaviors to better suit its environment. It has never been scientifically accepted that animals and plants consciously choose to change their own DNA for this purpose. So then, what is it that is doing the changing? It may very well be that a conscious universe is playing the role of observer and adapter in the case of micro-evolution and macro-evolution. This process occurs much like a laboratory experiment in which conditions are slowly changed over time and yet despite the continual change, the system remains constantly balanced so that life can continue on as many levels of scale and in as many varieties as possible. It is as though a scientist is tending to his/her experiment, or a gardener seeing that their plants are as prosperous as possible. Granted, there are several stipulations of non-interference within the nature of this figurative gardener, the overall process seems to prefer situations in which life and prosperity are, to some degree, maintained. In addition to the process of evolution, there are numerous examples of evidence which prove the likelihood that the universe is observing and responding to our conscious intent. The observer effect, the Maharishi effect, as well as the notable ability of large groups of people to change the results of random number generation programs on computers—each of these examples shows that our individual and collective choices of focus hold the potential to alter physical reality. These phenomena suggest that the universe is not only conscious, but that it responds to us and the energy of our intention. Additionally, the principle of quantum entanglement (or as Einstein put it, "spooky action from a distance") seems to suggest that the apparent reality of space is an illusion, or more accurately, a hologram. The proposal that the universe is holographic would explain the entirety of our exploration. The subjects of fractal geometric structures manifesting at virtually every level of scale, the expression of the exact same mathematical constants (phi ratio, the Platonic solids, the Fibonacci spiral, and close-packed spheres) throughout the universe, the expression of consciousness within animate and inanimate objects, and the perception of linear time could all be explained by the principle of a holographic universe. If the universe is truly holographic in nature, then due to the nature of holographic projection, the central point of this hologram would contain the entirety of all varieties of expression in the universe. Every planet, star, every life form would, in some way, be expressed throughout the entire universe, and that include humanoid life as well. It may be that the reason we see so many similarities between the mind and the universe is because the mind—however we might define it—is a fractal expression of the universe. This is not to claim the existence of any deity necessarily, but the concept of a conscious universe would explain why ancient civilizations of the world created belief systems which personified this macro-consciousness. In this way, everything we believe to be real in the universe may simply be an illusion. The passage of time, the ground we walk on, the food we eat, and the sum total of every single possible experience a person can have in a lifetime may all simply be illusions in the grand design and mental experiment of a super-consciousness attempting to understand and appreciate itself. To add, if in fact, we are separate holographic expressions of the same super-consciousness, this would mean that our separation is illusory, and that at a fundamental level, we, everyone, and everything around us are united as one. What are space and time? Could these concepts be mere perceptions of our human consciousness created to assist us in experiencing our chosen reality? If we change our preconceptions and assumptions about reality, will our reality change? If we open our minds to these new possibilities, we just might find out.